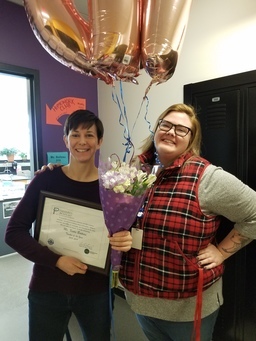 Congratulations to Ms. Katie Boiteau, who was nominated by her peers, as our teacher of the year for the 2018-2019 school year. Ms. Katie Boiteau is an exemplary teacher and community member at Pathways Academy of Technology & Design. For many reasons, she is the epitome of a strong and dedicated educator, and she displays her strong values on a daily basis as a classroom teacher and academic leader. As a teacher, student achievement is her top priority. She crafts highly engaging lessons for her students and displays her creativity aligned with the Next Generation Science Standards (NGSS) with collaborative hands-on projects in the areas of Physics, Chemistry and Environmental Science, which is no easy feat considering the difficult and demanding subject matter and standards. Ms. Boiteau has been a leader in developing curriculum and content for the NGSS and has worked collaboratively with the Hartford Public Schools district on creating appropriate curriculum sequenced to the NGSS. In turn, she has delivers weekly professional development to the science department she leads at Pathways. In addition to her core content curriculum, she has spearheaded designing and implementing our school's SAT Prep program serving as the leader and Khan Academy liaison. She continuously seeks out professional development opportunities to improve her pedagogy and instructional practices. Along with academics, Ms. Boiteau has a strong commitment to the school and district community. She has been a class advisor and advisory team leader. From planning activities such as the senior trip and prom to organizing fundraisers and events, she has built important and meaningful relationships with students, parents, staff, and community members. Leading her grade level advisory team, she works on crafting and collaborating on lessons that incorporate our themes of technology integration, project-based learning, and work-based learning. Recently, she has been developing community circles for the entire freshmen class to participate in as part of our school-wide restorative actions and practices, which has had a significant impact on our school climate and culture. This past year, she was also part of the School Governance Council and charged with the pivotal task of selecting a new principal for Pathways. This role was vital to shaping not only the school itself but contributing to the district-wide community. Ms. Boiteau is a valued and dedicated member of the Hartford Public Schools family, and she is a true role model for teachers and students. Her commitment to excellence is evident throughout her various activities and work, and our community benefits greatly through her outstanding work and leadership. Congratulations Ms. Boiteau!